We've been taking some basic cooking classes at Le Cordon Bleu. Last weekend was Braising and Roasting. It's a little chaotic, as you might expect when 30 students are in one large kitchen trying to prepare the same 4 dishes: beef stew, chicken fricassee, ballotines de poulet grandmere, and roast chicken with pan gravy. They divided us up into groups of 7 or 8 and then we paired up to make the various recipes. I decided I'd watch everyone do the braising recipes and I'd pair with my friend's mother to roast the chicken. 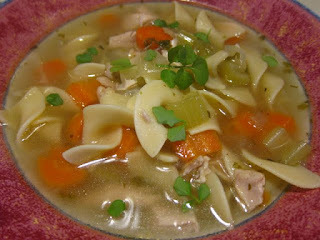 I learned: how to truss a chicken, how to cut up a chicken into 8 servable pieces, that the combination of onion, celery, and carrot is called mirepoix and it's used in most French cooking, and that cooking the mirepoix before making soup releases more flavor than just dumping carrots, celery and onion into the boiling soup. Oh, and that they use white pepper in France so we should, too. At least if we're cooking French dishes. I have been inspired by An Everlasting Meal to think about using the scraps of vegetables for stock rather than waste them. So I took the scraps from the soup vegetables (onions, carrots, and celery, our mirepoix, see below) and tossed them in a pot with the chicken bones, 9 pints of water, kosher salt, pepper, parsley stems and a bay leaf. This simmered for 2 hours and was strained, some of the fat was skimmed off (there wasn't much) and 9 pints of stock are now in the pressure canner - 20 minutes at 10 pounds. I took the white meat from the chicken and chopped it. I mixed this with chopped celery and dill pickles, Miracle Whip, salt and pepper. This may be dinner tonight, depending on how late we get home from the 10-year-old's band concert. I made a mirepoix by chopping onion, celery and carrots and then frying them in canola oil. ("No olive oil! It smokes too much," says Chef.) It seems that the vegetables should be cut brunoise, which is an 1/8-inch dice. But for soup, I wanted the pieces chunkier so I left them bite sized. See how many new terms I've learned? To this I added diced chicken (everything which didn't go in the chicken salad), 5 pints of water, kosher salt, pepper, bay, thyme, and fresh parsley. This simmered for about an hour then I added half a bag of egg noodles and let them cook. I discovered, after reading this blog just this morning, that I have bittercress growing in my front yard - so I picked some and used it as a garnish. I added the rest of the bittercress to the pot before putting the soup in the fridge. No canning for this one, as the noodles will expand too much. It is tasty! Thanks, Marina! Glad to see you here!